Field and clay targeting shooting is one of the most competitive sports within the Amauter Trapshooting Association, where even single clay can often be the difference between standing on the podium and going home empty handed. 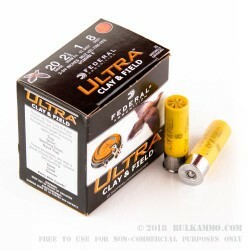 With the introduction of the Federal 20 gauge Ultra Clay & Field 2-¾ #8 shotshell, you can be certain that your ammunition is more than capable of rising to any challenge you put before it. 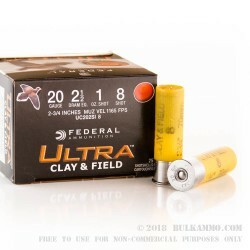 The Federal 20 gauge Ultra Clay & Field 2-¾ #8 shotshell is specially engineered for trap and sporting clay shooters looking to squeeze every last bit of accuracy and performance out of their existing semi-auto or break action shotguns. 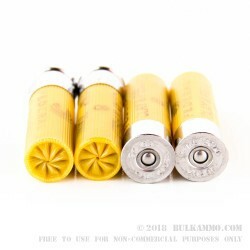 Federal brand wad columns are used to ensure minimal shot deformation upon ignition of the primer, and designed to keep a tight, dense pattern leaves the shot leaves the barrel. Only 100% pure brass heads are used to guarantee reliable extraction and ejection of the spent casings, and match grade propellants are precisely measured to ensure a consistent and reliable shot formation round after round. 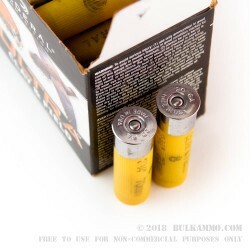 Whether you are a professional trap shooter, or merely looking to hone your skills, the Federal 20 gauge Ultra Clay & Field 2-¾ #8 shotshell will take your performance to the next level.